"Gulick Hygiene Series: Book Two - 2" by Normadeane Armstrong Ph.D, A.N.P. 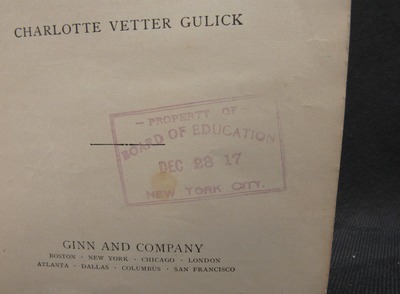 This book was previously owned by the Board of Education, New York City. On the back of the cover, the book contains a label used to keep track of students who had possession of the book. The name Muriel Rosen is written on the label as well as the date 1930. The front flyleaf also contains the name, Lorraine Bartel. Lastly, there is a Property of Board of Education: New York City stamp on the cover page, it is dated December 28, 1917.